RECIPE TITLE "Essential Simmered Tomato-Habanero Suce (Jemate Frito) "
How the mettle of roasted tomatoes changes when simmered with habanero! 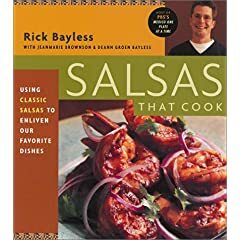 Sure, the hot chile gives them some piquancy (though the chile in this recipe is just cut in half in traditional Yucatecan style, so it won't impart much), but they also take on that flavor so many of us have grown to love -- fruity, herby, complex. In short, deliciously, unusually habanero. This is a cooked mixture (hence the name sauce), but it's thought of more as a salsa in Yucatan, set out at room temperature to spoon on another preparation. That's mostly how we've used it throughout the book, but feel free to add 1 cup of chicken broth to it once it's reduced and simmer for an additional 15 minutes. You'll have an all-purpose habanero sauce to use on enchiladas or eggs. Yucatecans roast lots of their vegetables, usually on a griddle since ovens with broilers are not common. I've described the traditional method for the tomatoes, then given you the simpler, more controlled broiler method. Replacing fresh tomatoes with good-quality canned is an option (you'll need a 28-ounce can); you'll miss the toasty flavor, but the sauce will certainly be worth making. 1. Roasting the tomatoes. The griddle method: Line a griddle or heavy skillet with aluminum foil and heat over medium. Lay the tomatoes on the foil and roast, turning several times, until blistered, blackened and softened, about 10 minutes. Don't worry if some of the skin sticks to the foil. The broiler method: Lay the tomatoes on a baking sheet and place about 4 inches below a very hot broiler. Roast until blistered and blackened on one side, about 6 minutes; flip the tomatoes and roast the other side. Cool, then peel, collecting any juices with the tomatoes. Coarsely puree tomatoes and juices in a food processor or blender. 2. The sauce. In a medium-size (2- to 3-quart) saucepan, heat the lard or oil over medium. Add the onion and fry until deep golden, about 8 minutes. Add the tomatoes and chile halves and simmer 15 minutes or so, stirring often, until nicely reduced but not dry (it should be an easily spoonable consistency). Taste (it will be wonderfully picante and nicely perfumed), season with salt, remove the chile if you want and it's ready to use. Advance Preparation -- Covered and refrigerated, the sauce will keep for several days; it also freezes well. Other Chiles You Can Use -- Jalapeños and serranos (3 to 5) and manzanos (1 to 2) can replace the habaneros. Spicy Stuffed Zucchini -- Slice 2 large zucchinis in haft lengthwise and scoop out the center with a small spoon to make 4 "boats." Warm 1/2 cup cream cheese in a microwave, then mix in 1 1/2 cups fresh corn kernels and 1/3 cup soft bread crumbs; salt. Stuff into the zucchini boats and bake at 350 degrees on an oiled baking sheet until the zucchini is crisp-tender, about 20 minutes. Spoon warm salsa over the boats and sprinkle with cilantro. Simple Black Bean Dinner -- If you have a pot of seasoned, cooked black beans on hand, simmer it for 20 or 30 minutes with 1/2 cup chorizo sausage or with cubed smoked sausage. Serve topped with big dollops of this sauce and chopped cilantro. 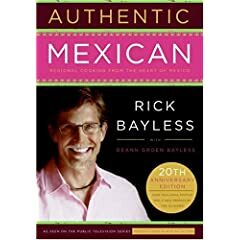 These days, I'm glad to say, you can find a variety of chiles in most grocery stores, especially in areas with large Mexican populations or in stores that offer specialty items. You'll find fresh chiles in the produce section, of course, dried chiles with ethnic ingredients or spices. In grocery stores and specialty food shops, dried chiles are often sold in small packages; you'll need to go there with an idea of what you're looking for (they're sometimes mislabeled) and be prepared to pay the specialty-store price. Mexican groceries are the best places to buy your chiles, since a greater demand usually translates into freshness. There, too, you'll need to know what you're looking for, since the chiles may not be labeled at all. 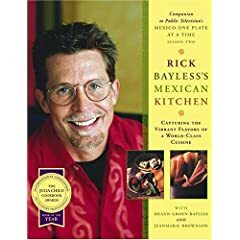 To find a Mexican grocery, ask around for a Mexican community, then visit its business district, preferably on a Sunday afternoon when the grocery stores tend to be hopping and have special offerings (like carnitas, barbacoa, cactus salad, chicharrón, masa for tortillas or tamales -- all the special stuff for a great Sunday dinner). If there's no Mexican grocery nearby and no specialty food shop that is Mexican-friendly, refer to Sources, where I've listed a few mail-order companies that offer good variety of high-quality dried chiles and other ingredients. Onions (and garlic) form the warp in a Mexican sauce, into which more assertive flavors are woven. They add texture and brightness when stirred in raw (see notes on Deflaming Onions, for the Mexican way to tame their bite); they enrich with a delicate sweetness when cooked. North of the Río Grande, we think of onions as yellow; south they are white. Yet despite the similarity of the two, they really are not interchangeable. Yellows have a more complex, herbal, sweeter flavor; whites are tangy and sharp with a clean, crisp flavor and texture. In Mexican food, that yellow-onion complexity translates as a muddy taste, I feel, especially when used raw. Thankfully, white onions are readily available in most grocery stores throughout the United States. The green-tops-on variety that Mexicans love to slice raw over finished dishes can be found in Mexican groceries and farmer's markets. Red onions are used extensively in Yucatan and regularly throughout the rest of the country (though, to my understanding, they're thought of as a specialty onion -- one used for pickling). Supersweet types like Vidalia are not part of the general offerings in Mexico, and I doubt they ever will be. Their pure sugariness seems inappropriate for the role of onions in the cuisine. 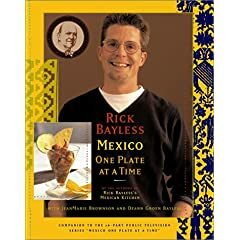 Stats: All the recipes in this book were cooked using an exact weight of onion that corresponds to whole white onions as follows: a small onion weighs 4 ounces, a medium 6 ounces and a large 8 ounces. A medium red onion weighs 8 ounces.